The best-selling Volkswagen Polo Vivo’s appeal now extends to commercial customers with the launch of the Polo Vivo Xpress. Like the Mk 2 Polo van of the 1980s, the Polo Vivo Xpress is, you’ve guessed it, basically a Polo light commercial. However unlike the panelled Polo of the late 1980s and early 1990s, the Vivo Xpress has rear doors and windows, like the fifth-generation Polo-based Polo Van on sale in Denmark. 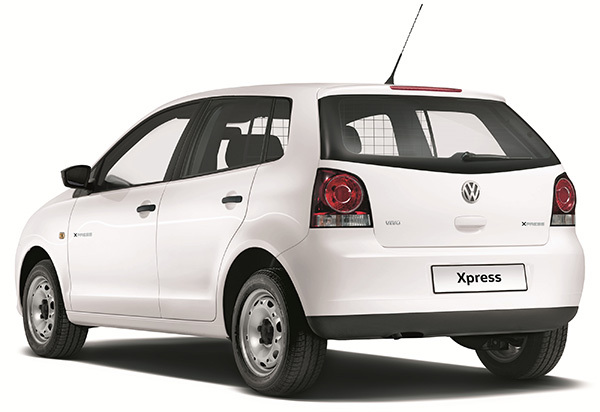 The Polo Vivo Xpress was created locally by Volkswagen Group South Africa Chairman and Managing Director Thomas Schaefer, in response to requests from fleet owners for a small VW delivery vehicle. The van was put into production by the Engineering Division in Volkswagen South Africa’s Uitenhage factory. 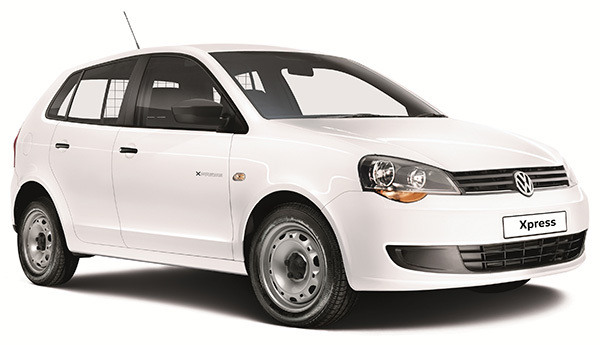 The Polo Vivo Xpress has a 519kg payload and a loading capacity volume of 1,060 litres. Powered by a 1.4-litre 74bhp petrol engine and based on the entry-level Polo Vivo Conceptline, it looks little different to the standard car. Steel wheels earn cool points, while external pointers include the 15mm raised suspension and ‘Xpress’ badges. 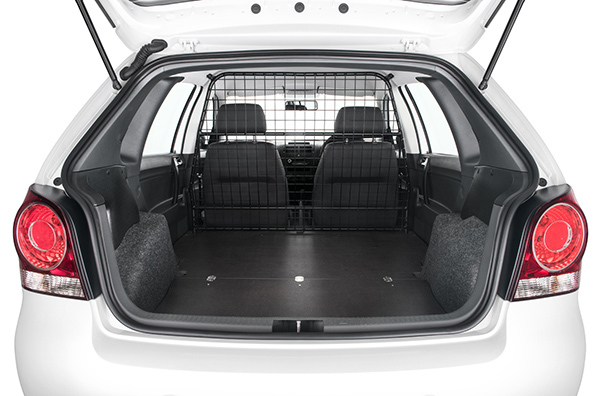 Inside, there’s a mesh partitioner between passengers and cargo, as well as hard wood flooring in the main load area. Standard equipment includes remote central locking with alarm and air conditioning, while cruise control, CD player, a rough road package (heavy duty shock absorbers and underbody guard) and 14-inch alloy wheels are optional. Volkswagen South Africa states that the Polo Vivo Xpress has been homologated as a N1 Commercial Vehicle which will allow VAT registered customers to claim back VAT. The small van is priced at R163,700 (VAT and emissions tax included). 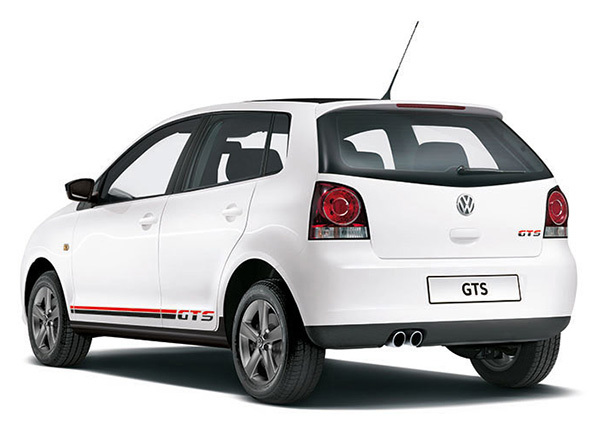 As well as the launch of the Xpress, Volkswagen has replaced the previous Polo Vivo GT derivative with the Polo Vivo GTS. Sadly, no Porsche-like GTS features are standard, but buyers do get a 103bhp 1.6-litre petrol engine. 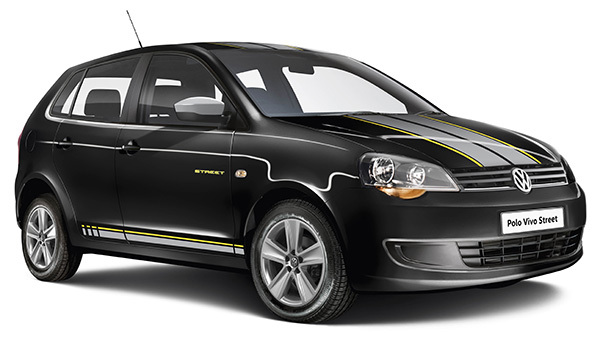 The Polo Vivo GTS also features a black-painted roof and mirrors, grey metallic 16-inch ‘Rivazza’ wheels, sports pedals, two-tone GTS body decals, and carpet mats with black piping and red stitching. 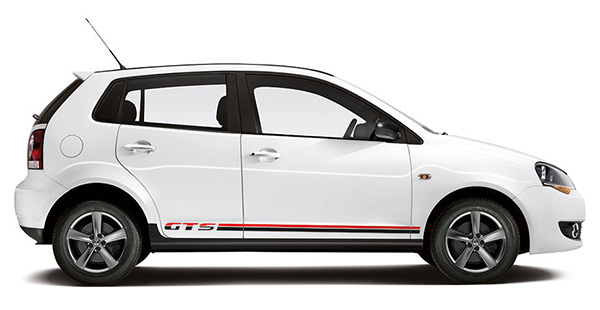 The Polo Vivo GTS is available in five colours: Pure White, Flash Red, Reflex Silver, Sunset Red and Pepper Gray. Prices start at R197,200 (VAT and emissions tax included). 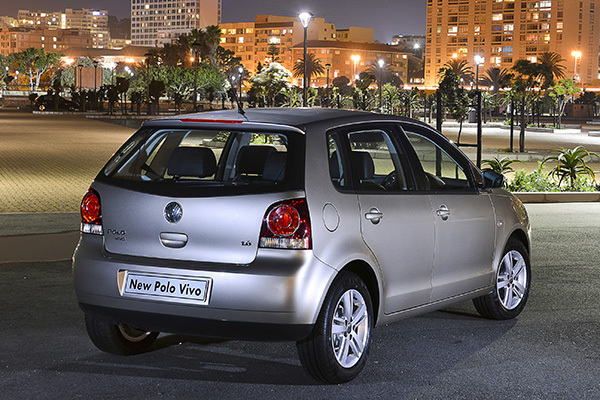 The Polo Vivo was South Africa’s best-selling passenger car last year, with 31,384 units sold. Also the best-selling car in South Africa since it was launched in 2010, along wth the Polo Vivo hatchback, there is also a sedan version. Both cars are based on an improved variant of the 2002-2009 Polo sold in Europe. Continuing its phenomenal success story, the Polo Vivo remains the best-selling passenger car in South Africa, with the fifth-generation Polo the runner-up. 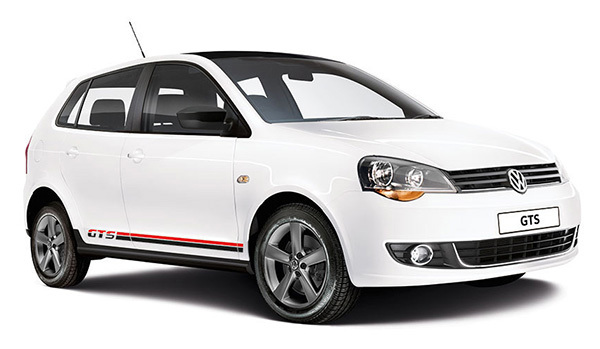 3170 Polo Vivos were sold in South Africa in October 2015 while 2320 Polo 6R/6Cs found new homes. Volkswagen Group South Africa still dominates the local passenger car market with a share of 22 per cent, the sixth year in a row it has done so. The company has sold 76,209 cars in the months from January to October 2015. Coinciding with the latest buoyant sales figures, Volkswagen South Africa has also launched a new version of the Polo Vivo to entice younger buyers with a sense of style. The R159,900 (VAT and emissions tax included) Polo Vivo Street gains a style package and new exterior colours, and is only available as a hatchback: no saloon version is offered. Powered by the standard Polo Vivo’s ubiquitous 1.4-litre 84bhp (63kW) petrol engine, the Street is spotted from its lesser brethren by its unique features which include silver mirror caps; 15-inch ‘Cordoba’ alloy wheels; 7mm lowered suspension; and the twin silver stripes on its bonnet, roof and lower front and rear doors. Inside, there is grey stitching on the leather steering wheel, gear lever and gaiter as well as its unique ‘Kadra’ seat trim. The sporty Polo Vivo GT has also been enhanced with the upgrade of 16-inch ‘Rivazza’ alloy wheels which replace the 15-inch rims the previous version sported. ‘Clark’ seat trim has also replaced the previous ‘Rocket’ upholstery. A Style package is also now available for 1.4-litre 84bhp (63kW) Trendline, 1.6-litre 103bhp (77kW) Trendline (Sedan) and 1.6-litre 103bhp (77kW) Comfortline derivatives. Features include 15-inch ‘Riverside’ alloy wheels, ‘Vienna’ leather seats, cruise control and chrome trim rings in the instrument cluster, as well as the ventilation and switch knobs. The Style package costs R13,000 for the Trendline models and R9,100 for the Comfortline variant. Finally, four new colours have been also added to the Polo Vivo palette. Buyers can now also choose Sunset Red Metallic, Blue Silk Metallic, Pepper Grey Metallic and Honey Orange (exclusively available for the Polo Vivo Maxx). The Polo Vivo was launched in March 2010 as an entry-level model for the South African market, replacing the Series 1 Golf-based CitiGolf and is based on the facelifted Series 4 Polo sold in Europe from 2005-2009. It is available as a three or five-door hatchback and four-door booted saloon with 74bhp/84bhp 1.4-litre and 103bhp 1.6-litre petrol engines. For more details on the Polo Vivo and Polo ranges in South Africa, visit the Volkswagen South Africa website. 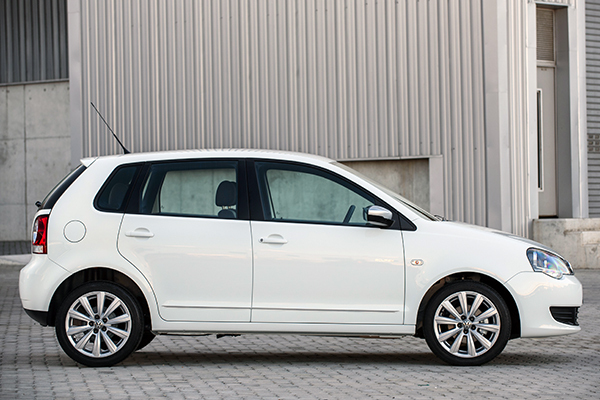 A new version of the best-selling Polo Vivo has been announced by Volkswagen South Africa. The Eclipse special edition is available in both five-door hatchback and four-door sedan body styles, and is powered by a 1.4-litre 63kW (84bhp) petrol engine. Tax-inclusive prices start at R168,600 for the hatchback and rise to R174,600 for the sedan. Distinguished by Pure White or Deep Pearlescent Black paintwork, the Eclipse gains silver-coloured door mirrors, 16-inch ‘Mistral’ alloy wheels, ‘Eclipse’ badging, chrome strips on the boot edge, and lowered suspension. Inside, the centre console has a ‘steel graphite’ finish, a leather-trimmed steering wheel, gear lever and handbrake grip, as well as ‘Global’ seat fabric. Both cars come with a 3-year/120,000km warranty and a 6-year anti-corrosion warranty. A 5-year/60,000km Volkswagen Automotion Maintenance Plan as well as a 5-year/60,000 km Service Plan are available as options. A 15,000km service interval is standard. ‘Polo Vivo has been the dominant model in the local A0 hatch segment in spite of the new competitor models being launched. Its key product attributes such as affordability, German build quality, safety, space and comfort have a set an unparalleled benchmark in the segment. ‘These attributes continue to re-affirm Polo Vivo’s unique offering of “affordable and accessible mobility” to the South African customers. The cost of ownership over a 3-year cycle makes Polo Vivo one of the cheapest cars to own in the South Africa market,’ said Petra Hoffmann, Volkswagen Group South Africa Director, Sales and Marketing. With over 175,000 sold since its introduction in March 2010, the 2005-2009 Mk 4 Polo-based Polo Vivo range has dominated the ‘A0’ hatchback market in South Africa, and is continually in the NAAMSA monthly best-selling car lists. The car, along with its Polo 6C sibling are the only locally-built models in the segment, and have a combined market share of 33 per cent. The Polo Vivo’s recent model refresh seems to have made Volkswagen’s South African entry-level model even more appealing, as it was once again the top-selling passenger car in the country during October. In total, 3491 Polo Vivos found buyers last month. In a repeat of September, the current Polo 6R was also in the top three best-sellers, sitting in third place. The also recently-refreshed model sold 2333 units, with an additional 5972 exported from Volkswagen South Africa’s Uitenhage plant. The latest figures released by the National Association of Automobile Manufacturers of South Africa (NAAMSA), show that once again the Toyota Corolla/Auris/Quest was in-between the two Polo models, with 2398 examples sold. The Polo Vivo was launched in March 2010 as an entry-level model for the South African market, replacing the Series 1 Golf-based CitiGolf, and is available as a three or five-door hatchback and four-door booted saloon with 74bhp/84bhp 1.4-litre and 103bhp 1.6-litre petrol engines. Costing from R142,700 for the base-model 1.4 Conceptline hatchback to R180,900 for the top 1.6 Polo Maxx, the 2014 Polo Vivo is based on the revised version of the Series 4 Polo (9N3), built from 2005 to 2009. A new version of the fifth-generation Polo (6R) is now available as a three and five-door hatch, in addition to the four-door Polo Sedan. Prices start at R194,500 for the Polo 1.2 TSI Trendline, rising to R253,000 for the Polo Sedan 1.6 TDI Comfortline. 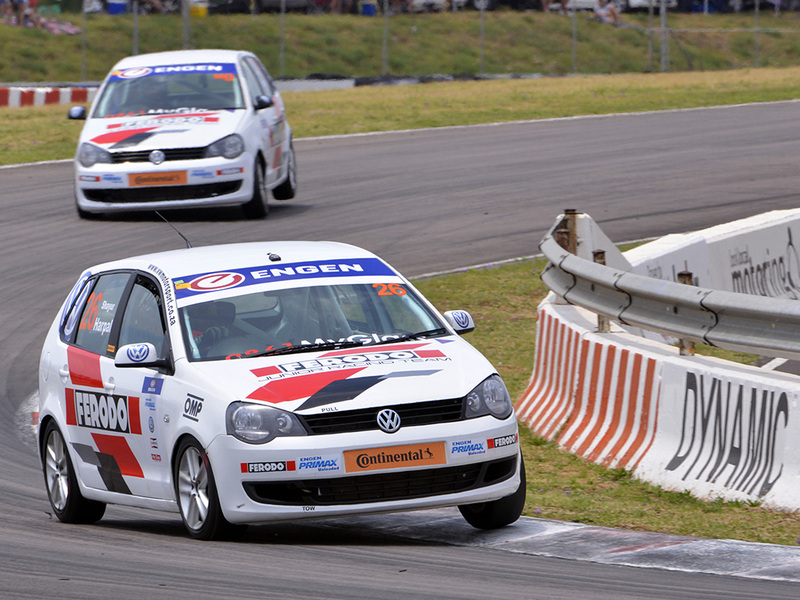 Zwartkops Raceway was host to the final round of the 2014 Engen Volkswagen Cup on 1 November. The popular South African racing circuit series crowned its 2014 champion at the event, and, at 15, Sheldon van der Linde is the youngest ever. The youngest national saloon car racing champion in South African history, Van der Linde’s brother Kelvin is also a former Engen Volkswagen Cup title holder. While Van der Linde won both races at the final meeting (as well as the Rookie of the Year prize), his team-mate Daniel Rowe came third in the championship, securing a Volkswagen Team Award for the 2014 season for Ferodo Racing. The outfit scored 11 race wins, 13 podium results, 14 pole position starts and 13 fast laps recorded between from 16 race starts. Van der Linde received R25 000 for his spectacular efforts in 2014, while second placed Dewald Brummer was awarded R15 000, with Rowe benefitting from R10 000 in prize money. Mathew Hodges claimed on the Masters title for the season, for drivers over the age of 27. Hodges has competed in this series for the past eight years. Behind Hodges in the Masters category, Trevor Bland was second and Juan Gerber was third, receiving R12 500, R7 500 and R5000 resepectively. The Most Improved Driver of the Year was awarded to Andrea Bate for her performance, improving from a 19th place finish in 2013 to finishing in seventh spot in 2014. The Driver of the Day award for the final race day of the year was made to Shaun La Reservée who finished second overall at the Zwartkops event.